The Los Angeles Broadway Theatre District holds a very special place in the hearts of generations of Angelenos and evokes the time at and before the Golden Age of Hollywood better than any area of the city. The Broadway Theater and Entertainment District Design Guide (CDO) provides guidelines and standards for development projects along Broadway between 2nd Street and Olympic Boulevard in Downtown Los Angeles. The intent of the Broadway Design Guide is to provide guidance and direction in the rehabilitation of existing structures and the design of new buildings to improve the appearance, enhance the identity, and promote the pedestrian environment of the Broadway corridor and to encourage the development of a regional entertainment district centered around its twelve historic theaters. The Broadway Streetscape Master Plan is one of L.A.'s first large-scale examples of a "Complete Streets" project. The plan will implement numerous pedestrian-oriented, traffic-calming tools for the historic Broadway corridor to provide greater pedestrian comfort and security along one of the city's busiest pedestrian streets, and make Broadway a more enjoyable place to walk, shop, and spend time. More than one million sq. feet of upper floor commercial space is vacant along Broadway and not all buildings are suitable for adaptive reuse to housing. Current ground floor retail vacancy is at 15-20%. Mom & Pop shops are sometimes discouraged from opening businesses on Broadway because of difficult a change of use process which is often faced in historic and older high-rises. It is unacceptable that, in the center of L.A.’s urban downtown, such beautiful buildings are so significantly underutilized, producing no jobs, no revenue and no support for revitalization in the area. With the Historic Commercial Reuse effort, that can change. For the past 15 years, downtown LA has led the way in helping Angelenos to reimagine their built environment. 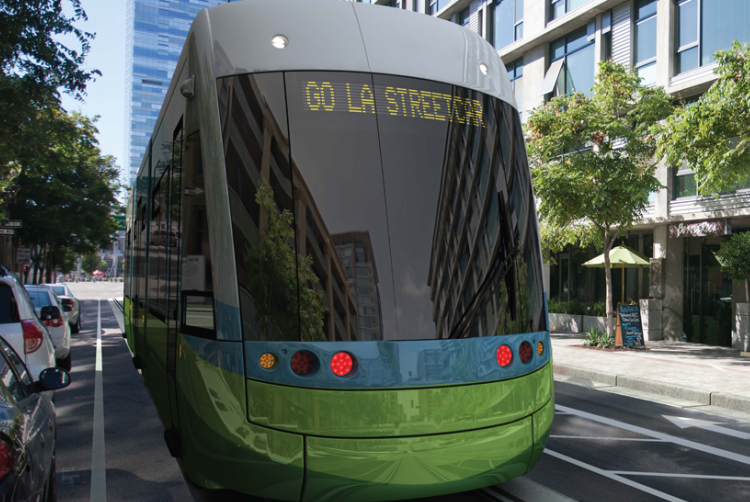 Together, we’re building a city that is more connected, active, fun, and sustainable than ever before, and the Los Angeles Streetcar is the next step along that path. Downtown LA is the cultural and economic hub of our region, and we think that once you get here it shouldn’t be quite so tough to get from one place to the next. Bringing Back Broadway’s $750,000 architectural façade lighting grant will complete the façade lighting of a dozen historic buildings on Broadway buildings in 2017. Façade lighting will help create a safer, more attractive Broadway and will highlight the architectural features of some of the corridor’s most beautiful historic building. It will also encourage a more active pedestrian environment and help drive new business to Broadway. As the sun set on the 8th anniversary of Councilmember Huizar’s Bringing Back Broadway initiative, an ambitious 10-year plan for the revitalization of the Historic Broadway corridor in Downtown LA, another major piece of Broadway-oriented public policy was adopted by L.A. City Council on Jan. 20. 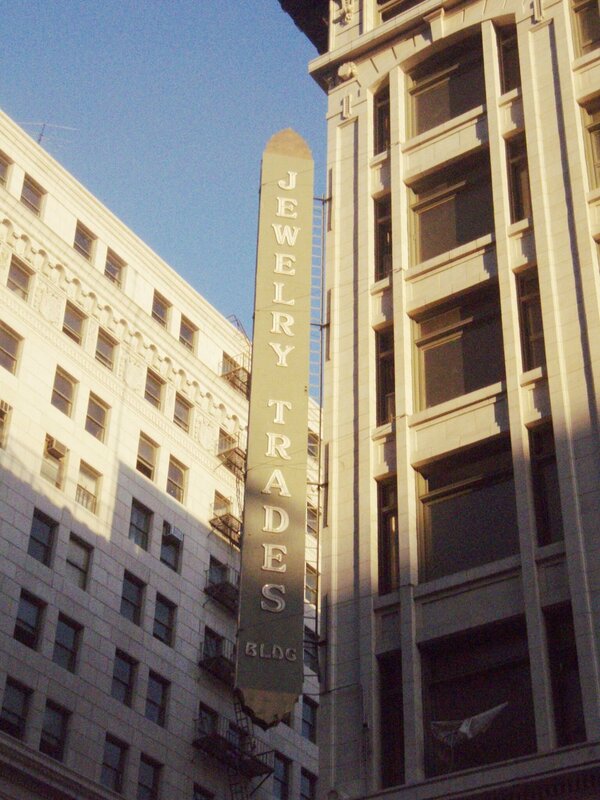 The Historic Broadway Sign District allows for a variety of sign types on Broadway between 1st and 12th Streets that will contribute to the historic nature of the Broadway district. Among other objectives, it encourages the recreation and restoration of historic signs, allows new large-scale painted signs on secondary facades, open panel roof signs, and vertical “blade signs” iconic to Broadway's hey-day. Broadway is considered one of the highest priorities in the nexus between historic preservation and revitalization because of its importance as part of our city's history. Its prominence as part of a National Register Historic District offers tremendous potential for reactivation and new uses which will allow these architectural and historical gems to be enjoyed by future generations. The Broadway Theatre District in Los Angeles features the largest concentration of historic theatres and movie palaces on one street in the nation, most of which date back to the 1920s and 1930s. Entertainment was always king on Broadway, but in the first half of the 20th century, Broadway enjoyed success as a business and retail destination and was considered the commercial capital of the nation. Broadway’s elegant high-rise buildings produce an uncommonly urban character that compares to famously vibrant cities like New York. The Broadway District boasts block after block of stunning Beaux Arts, Art Deco, and revival-style buildings which bestow the district with historic integrity uncommon in major metropolitan downtowns. Vaudeville stages were all the rage when the theatres were built and famous acts such as the Marx Brothers, Bob Hope, Houdini, Bing Crosby, Jack Benny, Will Rogers, Charlie Chaplin, Eddie Cantor, Lena Horne, George Burns & Gracie Allen, Duke Ellington, Judy Garland, and W.C. Fields all performed to the delight of Broadway audiences. Behind their deceptively simple exteriors, Broadway's ornate and spectacular theatres featured sweeping marble staircases leading to ornate balconies, plush seats, and soaring, star-sprinkled ceilings, along with spacious, elaborately crafted interiors, gilded rococo designs and a wide range of flamboyant architectural styles. When cinema became in vogue, the theatres were mostly converted to grand movie palaces, and functioned as such for many years before many of them closed their doors. The first Broadway department store was aptly located at 3rd and Broadway, while flagship stores for Bullocks, the May Company, and the Fifth Street Store, among others, stretched down the street. Beautiful examples of then-modern engineering, coupled with dedicated craftsmanship and architecture, created high-rises all along Broadway which reached heights of 12 stories and more. These buildings are filled with offices and manufacturing operations - and workers. The streetcar (the Yellow Car randown Broadway) delivered eager shoppers and workers to Broadway daily and the streets were bustling from morning to night. The Red Cars ran routes into the suburbs and throughout the entire Los Angeles area and its valleys. Broadway was an important part of the historic Route 66. In fact 7th & Broadway was the original terminus for Route 66, and an important corridor for the business and commercial activity that was integral to hat route in developing pathways through the west. In more recent decades, the proliferation of the shopping mall, the cinemaplex, and the creation of a modern high-rise financial district in the Southeast portion of Downtown has led to Broadway's slow, steady decline. Today, the ground floor bustles with activity on most days, but there is more than a million square feet of vacant commercial space in the upper floors of Broadway's buildings, only two of the twelve theatres are open for regular entertainment programming, and there is a 15-20% vacancy rate on the ground floor, which has been on the rise for quite a while. adopt policy to support Broadway’s needs, historic Broadway is poised for a rebound in function, feasibility and sustainability. The Broadway Theatre District in Los Angeles features the largest concentration of historic theatres and movie palaces on one street in the nation, most of which date back to the 1920's and 1930's. 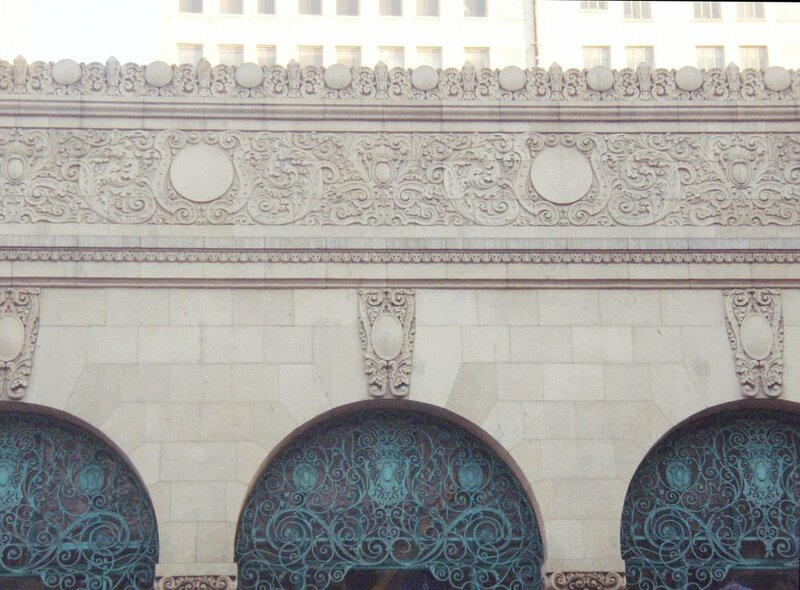 There are twelve historic theatres along Broadway in Downtown Los Angeles. Each offers a different and important glimpse into the history of our city, and its primary industry - entertainment. Vaudeville stages were all the rage when the theatres were built and famous acts such as the Marx Brothers, Bob Hope, Houdini, Bing Crosby, Jack Benny, Will Rogers, Charlie Chaplin, Eddie Cantor, Lena Horne, George Burns & Gracie Allen, Duke Ellington, Judy Garland, and W.C. Fields all performed to the delight of Broadway audiences. Behind their deceptively simple exteriors, Broadway's ornate and spectacular theatres featured sweeping marble staircases leading to ornate balconies, plush seats, and soaring, star-sprinkled ceilings, along with spacious, elaborately crafted interiors, gilded rococo designs and a wide range of flamboyant architectural styles. 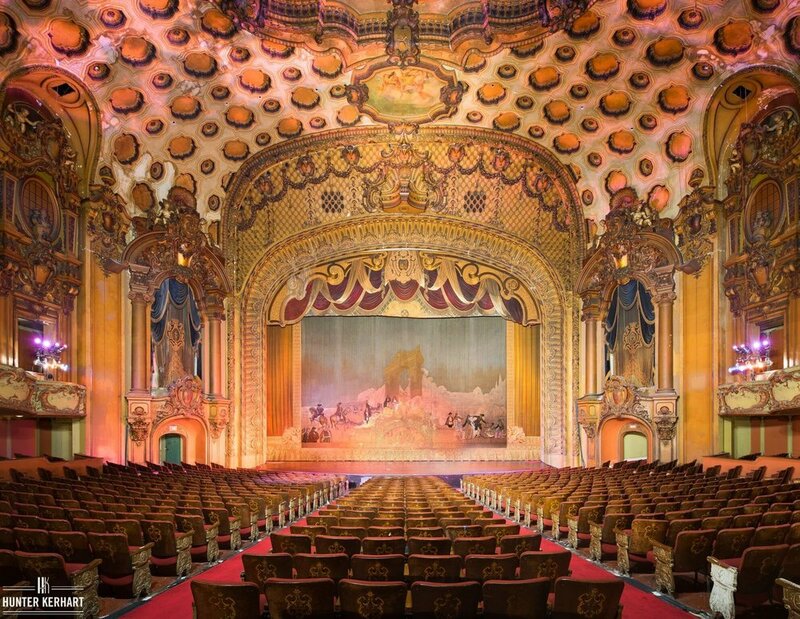 When cinema became in vogue, the theatres were mostly converted to grand movie palaces, and functioned as such for many years before many of them closed their doors.